NEWS: ALL COURSES NOW ON ROLLING ENROLLMENT!!! You select the start date most convenient for you (subject to class availability) and continue for 16 consecutive class sessions. Dogs do what works . . . you can too. Q: The PACKWORKS training centre is located in Smokey Point/Arlington, just off I5 at exit 206. I live an hour or so away; what makes Packworks worth the trip? 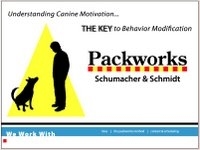 1) Packworks approach and methodology are different. If you have been working with your dog and you have reached a plateau with the methods you have been using, our unique training/behaviour modification protocols, coupled with our ability to replicate "real-life" (BUT CONTROLLED AND MANAGED) situational "set-ups" at our facility, will create fresh opportunities for both teaching and learning, for both you and your dog! 2) Packworks is worth the trip if you want to begin (correct and proper) obedience training in a low stress environment, using training methods and protocols that are OPTIMUM for your particular dog; this is especially so if the training alternative you are considering is a typical group class with a high number of students to one instructor/apprentice and/or a "one-size-fits-all" approach. 3) Packworks is worth the trip if you are concerned about aggressive behaviour; this is especially so if the alternative you are considering is to work with trainers who employ food-treats when addressing a defensive/aggression problem--and extra-especially so, if you are considering this alternative and your dog is a type that is predisposed to having a distinctly *we/they* view of the world. Most (adult) dogs of those breeds with a purpose-bred defense/guard drive (will or desire to protect) fall into this category, to varying degrees. Packworks extensive experience training and solving existing problems with in-service Police Patrol K9's for Law Enforcement Agencies brings a CRITICAL perspective, essential to truly understanding when and why dogs bite. 4) Packworks is worth the trip if you have a puppy or newly adopted adult dog, who had a less than ideal experience in a previous home, and you want to learn how to PROPERLY socialize him or her, and generally get started on the right foot. And, if you wish to have your puppy or dog APPROPRIATELY introduced and familiarized with a variety of different stimuli not readily available where you live. Or TOO READILY available, amounting to a frightening, overwhelming onslaught, resulting in the exact opposite of the desired result. There are very good ways and very NOT so good ways to "socialize" a puppy or dog. 5) Packworks is worth the trip if you are adding a new dog to your existing pack and you want to do it properly, with the least amount of stress for all concerned--humans and dogs. Packworks has a combined half-century of dog-rescue work. In furtherance of this community service, we have fostered, rehabilitated, and successfully placed hundreds and hundreds of dogs; as a result, our ability to recognize and/or to prevent potential issues between and among dogs has been finely honed. without worrying about making a mistake. If we want our dogs to respond to us when they are extremely stressed and/or otherwise highly motivated to do OTHER than what we are asking them to do, we first MUST teach them the skill/ability to do so and we MUST give them a reason to trust our judgment as leaders that doing so is in their best interest, as well. If we want our dogs to trust us, we FIRST must trust ourselves and our handling skills. At Packworks, you and your dog will each develop essential skills, as well as confidence and competence, in yourselves and each other, by SUCCESSFULLY working through difficult, stress-inducing situations. 7) Packworks is worth the trip if you want to make sure there are no viable alternatives to having your dog on one of the many popularly prescribed anti-depressants which do nothing whatsoever to address the underlying causative issues for the undesirable behaviour. 8) Packworks is worth the trip if you want to do (or are doing) sport/competitive work with your dog (i.e. herding, Schutzhund, SAR, competitive obedience, agility, etc.) and you want to do effective and specific problem-solving and behavior modification/obedience work that complements (vs. disrupts) the competitive work you do (or will do) with the same dog. To book a private training/behaviour modification session at the Packworks training centre, please email with your top three or four preferred days/dates and times, and a description of your dog's issues. PACKWORKS BEGLEITHUND COURSES CURRENTLY IN SESSION!